Cycling in Amsterdam is as natural as eating, sleeping or breathing. This makes the humble bicycle an essential tool used every day by everyone to get where they need to go. Still, the process of buying a bicycle can be a minefield. If you don’t have the right information, you might end up buying a piece of junk, or worse, needlessly spend endless amounts of money on repairs. How do I buy a bicycle in Amsterdam? How much should I pay for a bicycle in Amsterdam? How do I know that the bicycle hasn’t been stolen? What type of bicycle is best for Amsterdam? To skip ahead, click on one of the links above. In Amsterdam, there are a lot of ways to buy a bicycle: Facebook groups, local markets, flea markets, supermarket notice boards, Marktplaats, and to some extent, Craigslist. And of course: proper brick and mortar shops, who often stock both new and second hand bicycles. Unless you’re being really picky, it shouldn’t take you more than a couple of days to find yourself a bicycle. My first bicycle took me less than three hours from first contact to handing over my hard-earned Euros. Facebook groups are one of the easiest ways to buy a bicycle in Amsterdam. The two main groups are Bike Marketplace and Second Hand Bikes, but I’ve also had some luck with the general “buy and sell” groups such as Buy & Sell Amsterdam. If you want to “go local”, Marktplaats is the local equivalent of Craigslist or Gumtree. You’ll want to look for “fietsen” or “fiets, which is “bicycle” in Dutch. The typical bicycles you’ll see around Amsterdam are called “omafiets”, which roughly translates into “grandma’s bicycle” – cheap, comfortable, and generally indestructible. If you want to buy your bicycle from a local market, your best bet is the Waterlooplein Market near the centre of Amsterdam. As soon as you arrive, you’ll see a number of bicycles that are lined up for sale. Amsterdam loves its second-hand flea markets, and these can also be a great option for finding a great bicycle for cheap. If you can time it right, the best market to go to is the the monthly IJ-Hallen Market that is held in Amsterdam-Noord (North Amsterdam). It’s five Euros for entry, but you’ll have access to a huge selection of second-hand and vintage items, from clothes, furniture, and of course, bicycles. This is the biggest market in Europe, so it’s worth checking out regardless! Many supermarkets around the Netherlands have free noticeboards for locals to advertise things for sale. Bicycles are fairly common on these noticeboards, so have a peek at the noticeboard on your next visit to Albert Heijn. You might find better bicycles here, since they tend to be locals who aren’t going to sell you a dud bike and disappear from Facebook. Craigslist isn’t very popular in the Netherlands, but you’ll still find a few bicycles for sale here – usually by expats who haven’t figured out Marktplaats yet. The upside is that while not a lot of people are on Craigslist, so you have less competition. It’s possible snag a great deal here that you might not find otherwise. I personally wouldn’t bother with bicycle shops as they tend to be far more expensive than the other options, but if you want to be sure that you’re getting the real deal, it’s obvious – just go to a shop. They have a reputation to uphold, so the bicycle they sell you won’t be a piece of junk and they should be able to address any issues you spot. Some bicycle shops even offer 2-3 months of warranty, which is nice to have since most problems occur within the first couple of months. Expect to pay over at least 100+ Euros at a bicycle shop – realistically, around the 120-200 mark. Everyone has an opinion on the “right price” for a bicycle in Amsterdam, ranging from 40 Euros (probably stolen, from a junkie) to several hundred Euros. Personally, I’d say between 70-100 Euros is a sweet spot where you’ll get a bicycle that works perfectly but isn’t so shiny that makes it an attractive bicycle for thieves. What’s This About Stolen Bicycles in Amsterdam? As of 2016, over 300 bicycles are stolen in Amsterdam every single day. For this reason alone, I’d say that buying a “nice” bicycle in Amsterdam isn’t a great idea, unless you can ensure that it’s always going to be locked away indoors or in a storage room. If you’re still worried that the bicycle you’re about to buy is stolen, you can always check the bicycle theft register. It’s in Dutch, but you should be able to get a good idea of how it works by using Google Translate. It can be tempting to buy a vintage racing bike (hey, we’ve all been there), but the holy grail of bicycles in Amsterdam is one that works perfectly but looks like a complete piece of junk. Function over form! 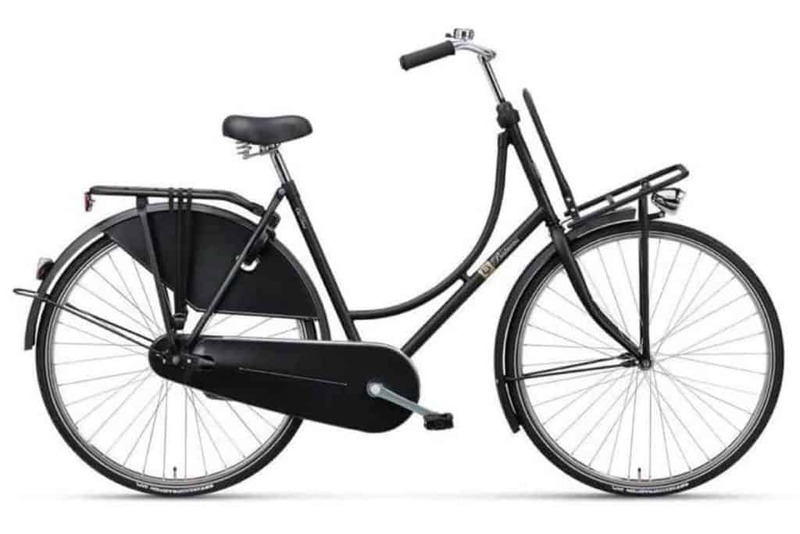 What’s the Best Bicycle for Amsterdam? A bicycle with all of these features can be hard to find on a budget, but even finding 70% of these features is a very good buy. The bicycle ecosystem in Amsterdam is a fast-moving one, and there are plenty of options when it comes to buying your first bicycle. It’s best to try all the different channels to find a bicycle you like – whether it meets the criteria I’ve mentioned above, or not – and you should be rolling on two wheels in no time. Personally, I’d go for a bicycle that’s reliable, low-maintenance and doesn’t look that great (to deter thieves), but if you want a shiny new racing bike, that’s totally up to you. On a final note: once you have a bicycle, get yourself a basic multi-tool and a puncture repair kit from HEMA or any bicycle store. They really cost next to nothing, and in the long run will be far cheaper than going to a shop for punctures (it happens to everyone!). And if you don’t know how to fix a puncture… YouTube is your friend!